Got away from Bangkok to Koh Samui as seen above, which has an airport so I was able to avoid a 10 hour bus ride and 2 hour boat ride. 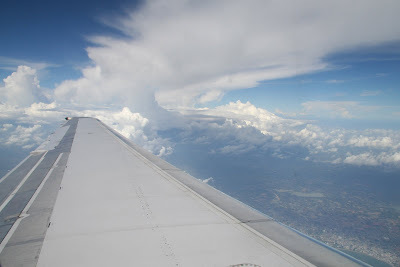 The flight was $240 US return, worth it and it was also the best flight to this point with sandwich which you would never get on a 45 min flight in Canada. The pilot was a bit of a nutter though, accelerating on the corner to the runway (I think we were in the air using only a 1/4 of the runway). 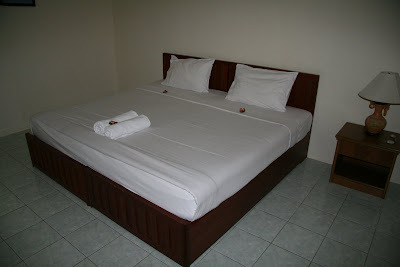 Stayed at Baan Talay, which is nice and right on the beach. I would probably aim for something a little closer to the heart of Chaweng because taxi prices go way up in the evening from $3 US during the day to $10 US at night (I guess that doesn't sound so bad). Instead I rode on the back of my waiter Tommy's scooter to a couple of bars. He weighs 50 kg and I way 83 kg so it was a little unstable to say the least. Checked out Solo bar and some others. I liked Solo, but Tommy needed to dance. Koh Samui is definitely on the tourist side with tonnes of shopping (no need to go to Bangkok for shopping as they have it all). 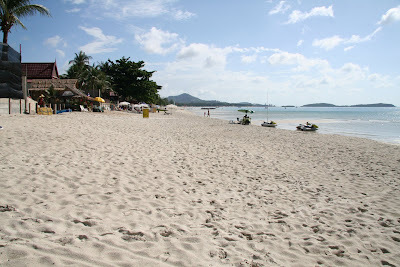 Samui reminded me of Puerto Vallarta, Mexico, which is ok, but does drive the prices for accommodation, beer and food up. Probably $100 plus US with accommodation here. Little flowers everywhere, that's pretty cool.